Interested in getting a visual picture of the Civil War and its veterans? Check out the images posted to the Flickr group Veterans of the American Civil War. According to David Foster, group administrator, this collection includes all types of images of Civil War veterans: taken during or after the war, in or out of uniform. No photos of my Union soldier ancestors yet, but I enjoyed getting a look at their comrades and those who fought on the other side. 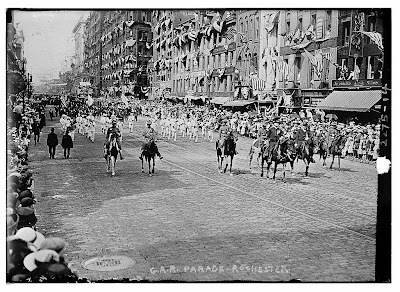 I especially enjoyed group photos like this one of a Grand Army of the Republic parade in Rochester, New York around 1910. For more Flickr groups related to Civil War research and genealogy, see Jennifer's post Flickr Civil War Pools [Tidbits] at Rainy Day Genealogy Readings. Getting to Know "Small-leaved Shamrock"